Main purpose of this thesis is to analysis Wireless Networking Using by WiMAX. Report focus on about WiMAX technology which brings true broadband connectivity to vertical applications and QoS allows operators to offer prioritized access and SLAs and single wireless interface supports voice and data services, all these are WiMAX feature. By Wimax customers get range of technology and service level choices from both fixed and wireless broad band operators. The demand for broadband access everywhere is increasing rapidly as Internet services, enterprise as well as private, are getting more and more reliable, secure and easy to use. Consumers and patrons want to access Internet services at an affordable price with an acceptable, relevant performance and speed. In the absence of common, homogenous British Waterfowl Association (BWA) standards, a number of proprietary technologies have emerged. A technology developed to fulfill these characteristics, standardized by IEEE is 802.16. Even though this IEEE standard is limited to the air interface, it is commonly referred to as Worldwide Interoperability for Microwave Access (WiMAX). WiMAX, the Worldwide Interoperability for Microwave Access, is a telecommunications technology aimed at providing wireless data over long distances in a variety of ways, from point-to-point links to full mobile cellular type access. It is based on the IEEE 802.16 standard, which is also called WirelessMAN. The name “WiMAX” was created by the WiMAX Forum was formed in jone 2001.Worldwide Interoperability Microwave Access (WiMAX) forum promises to offer high data rate over large areas to a large number of users where broadband is unavailable . The forum describes WiMAX as “a standards-based technology enabling the delivery of last mile wireless broadband access as an alternative to cable and DSL”. WiMAX has the potential to replace a number of existing telecommunications infrastructures. In a fixed wireless configuration it can replace the telephone company’s copper wire networks, the cable TV’s coaxial cable infrastructure while offering Internet Service Provider (ISP) services. In its mobile variant, WiMAX has the potential to replace cellular networks. The WiMAX Forum Certified logo is applicable for both Fixed and mobile WiMAX Devices WiMAX Forum goal is to accelerate the introduction of these systems into the marketplace. WiMAX Forum Certified™ products are fully interoperable and support broadband fixed, portable and mobile services. Along these lines, the WiMAX Forum works closely with service providers and regulators to ensure that WiMAX Forum Certified systems meet customer and government requirements. WiMAX technology brings true broadband connectivity to vertical applications. QoS allows operators to offer prioritized access and SLAs. A single wireless interface supports voice and data services. WiMAX’s end-to-end Internet Protocol (IP) core network facilitates integration with enterprise internal networks. PMP applications include telemetry or remote monitoring, with increased functionality (e.g., remote control of assets, video feedback, and secure data transmission). Mobile workforce applications require full voice and video support and will increase productivity of employees on the ground. In-vehicle applications enable the enterprise to track vehicles, stream content to them, and coordinate workflow with the driver and passengers. Wider choice of devices at a lower cost is expected as volumes of sale for WiMAX modules grow. Devices with multiple wireless interfaces provide increased flexibility and coverage. Wireless connectivity increases operational efficiency and brings cost savings. Enterprises have become more comfortable with wireless applications in general, and specifically with access through public networks. Where used, private proprietary networks often prove to be too expensive to build and operate, and their capacity is typically limited. WiMAX access through public networks avoids this cost burden. The IEEE 802.16 group was formed in 1998 to develop an air-interface standard for wireless broadband. The group’s initial focus was the development of a LOS-based point-to-multipoint wireless broadband system for operation in the 10GHz–66GHz millimeter wave band. The resulting standard—the original 802.16 standard, completed in December 2001—was based on a single-carrier physical (PHY) layer with a burst time division multiplexed (TDM) MAC layer. The IEEE 802.16 group subsequently produced 802.16a, an amendment to the standard, to include NLOS applications in the 2GHz–11GHz band, using an Orthogonal frequency division multiplexing (OFDM)-based physical layer. Additions to the MAC layer, such as support for Orthogonal frequency division multiple access (OFDMA), were also included. Further revisions resulted in a new standard in 2004, called IEEE 802.16-2004, which replaced all prior versions and formed the basis for the first WiMAX solution. These early WiMAX solutions based on IEEE 802.16-2004 targeted fixed applications, and we will refer to these as fixed WiMAX. In December 2005, the IEEE group completed and approved IEEE 802.16e-2005, an amendment to the IEEE 802.16-2004 standard that added mobility support. 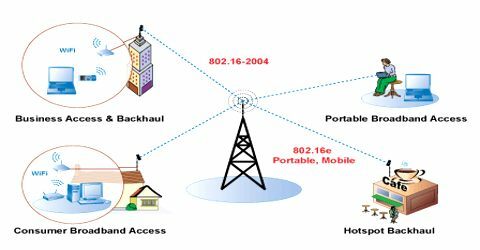 The IEEE 802.16e-2005 forms the basis for the WiMAX solution for nomadic and mobile applications and is often referred to as mobile WiMAX. 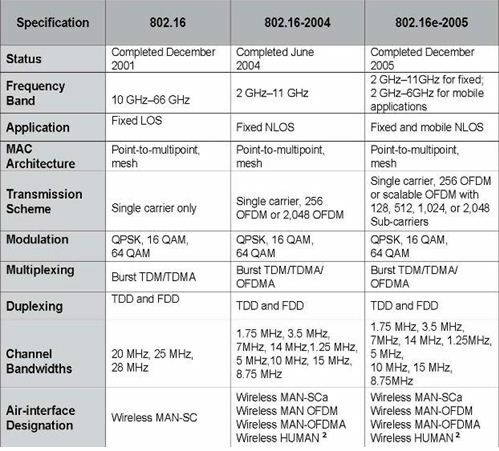 The basic characteristics of the various IEEE 802.16 standards are summarized in Table 1.1. Note that these standards offer a variety of fundamentally different design options. For example, there are multiple physical-layer choices: a single-carrier-based physical layer called Wireless- MAN-SCa, an OFDM-based physical layer called WirelessMAN-OFDM, and an OFDMA based physical layer called Wireless-OFDMA. Similarly, there are multiple choices for MAC architecture, duplexing, frequency band of operation, etc. These standards were developed to suit a variety of applications and deployment scenarios, and hence offer a plethora of design choices for system developers. In fact, one could say that IEEE 802.16 is a collection of standards, not one single interoperable standard. For practical reasons of interoperability, the scope of the standard needs to be reduced, and a smaller set of design choices for implementation need to be defined. The WiMAX Forum does this by defining a limited number of system profiles and certification profiles. A system profile defines the subset of mandatory and optional physical- and MAC-layer features selected by the WiMAX Forum from the IEEE 802.16-2004 or IEEE 802.16e-2005 standard. It should be noted that the mandatory and optional status of a particular feature within a WiMAX system profile may be different from what it is in the original IEEE standard. Currently, the WiMAX Forum has two different system profiles: one based on IEEE 802.16-2004, OFDM PHY, called the fixed system profile; the other one based on IEEE 802.16e-2005 scalable OFDMA PHY, called the mobility system profile. A certification profile is defined as a particular instantiation of a system profile where the operating frequency, channel bandwidth, and duplexing mode are also specified. WiMAX equipment are certified for interoperability against a particular certification profile. The WiMAX Forum has thus far defined five fixed certification profiles (Table 1.2). To date, there are two fixed WiMAX profiles against which equipment have been certified. These are 3.5 GHz systems operating over a 3.5 MHz channel, using the fixed system profile based on the IEEE 802.16-2004 OFDM physical layer with a point-to-multipoint MAC. One of the profiles uses frequency division duplexing (FDD) and the other uses time division duplexing (TDD). IEEE 802.16a is designed for systems operating in the frequency bands between 2-11GHz supporting Non-Line-of-Sight (NLOS). This is the underlying difference in the two frequency ranges, the lower bands are able to support NLOS which is otherwise difficult to achieve with the higher frequencies specified in the previous version of this standard. Over and above this the MAC layer capabilities were enhanced and support for additional physical layers was defined. The ETSI HIPERMAN standard was supported. IEEE 802.16b is designed to work in the unlicensed frequency bands of 5-6 GHz (but will be applicable to license exempt 2-11GHz where possible). Physical layer protocols were defined stipulating OFDMA (Orthogonal Frequency Division Multiplex Access). IEEE 802.16c concentrated on updates in the 10-66GHz range. Other key factors it addressed included issues relating to performance evaluation, testing and detailed system profiling. This was crucial because there were many options available with 802.16 in general; the system profile methodology evolved to define what would be mandatory and what would be optional features. Mandatory features provided a guide for vendors to ensure interoperability. Optional features such as different levels of security protocols allowed vendors room for differentiation in terms of price, functionality and market niche. IEEE 802.16-2004(d) is the sum product of the all of the above standards rolled up into one. Amongst other tweaks, out of the three physical layer modulation schemes supported, the chosen system profile is OFDM 256-FFT (Orthogonal Frequency Division Multiplex 256­Fast Fourier Transform). Improvements were made to the quality of service (QoS). Support was also extended for the concatenation of both PDUs (protocol data units) and SDUs (service data units) thus reducing MAC overheads. Fixed WiMAX defines as 802.16d.WiMAX provides fixed service from a base station to a subscriber station, also known as customer premise equipment (CPE). Some goals for WiMAX include a radius of service coverage up to 30 miles from a WiMAX base station for point-to-multipoint, non-line-of-sight service. This service should deliver approximately 40 megabits per second (Mbps) for fixed access applications. That WiMAX cell site should offer enough bandwidth to support hundreds of businesses with T1 speeds and thousands of residential customers with the equivalent of DSL services from one base station. Perhaps the most lucrative application for WiMAX is that of substitute for the telephone company’s copper wire. This is achieved through fixed wireless solutions. A majority of US businesses and residences receive their telephone service and internet access via the telephone company’s copper wires. A T1 data line from the telephone company may re-tail for $800/month in many US cities. About 50% of that expense is “local loop” charges or paying to use the telephone company’s copper wire to access a wider network. As the diagram below illustrates, a WiMAX service provider could purchase the bandwidth equivalent of a T1 (1.54 Mbps) at, say, $45 and resell to an enterprise customer for $400. Through oversubscription (overselling), that service provider could realize a multiple of that profit. A fixed wireless solution not only offers competitive internet access, it can do the same for telephone service thus further bypassing the telephone company’s copper wire network. Voice over Internet Protocol (VoIP) offers a wider range of voice services at reduced cost to subscribers and service providers alike. The diagram below illustrates a typical solution where a WiMAX service provider can obtain wholesale VoIP services (no need for the WiMAX service provider to install and operate a VoIP softswitch) at about $5/number/month and resell to enterprise customers at $50. In residential markets, VoIP is a “must offer” service. Without the additional revenue per user, WiMAX does not offer a compelling reason to switch from other forms of residential broadband. When bundled with broadband internet access and IPTV, a WiMAX triple play becomes very attractive to residential subscribers. Given the QoS, security and reliability mechanisms built into WiMAX, subscribers will find WiMAX VoIP as good as or better than voice services from the telephone company. The third leg of the triple play is Internet Protocol Television (IPTV). 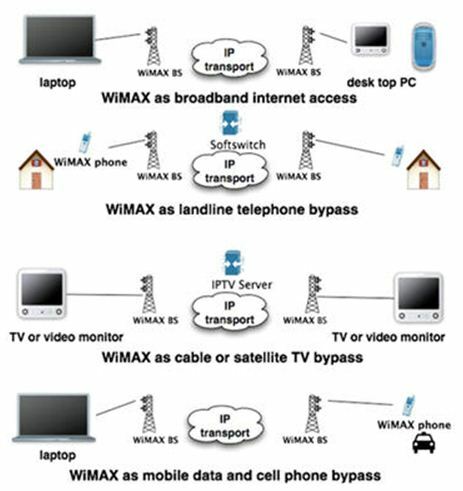 IPTV enables a WiMAX service provider to offer the same programming as cable or satellite TV service providers. IPTV, depending on compression algorithms, requires at least 1 Mbps of bandwidth between the WiMAX base station and the subscriber. Most people these days access the Internet by using wired broadband access, usually DSL, cable modem or a leased line. Some are lucky enough to use WiFi access, at home or in restaurants, hotels, coffee shops and libraries with WiFi hot spots. If there is no chance of finding or affording a broadband access provider, people usually use dial-up, although it is considered a technology of the past. However, there are problems with each of these technologies. Generally, broadband access isn’t available in all areas and if it is, it can also be quite expensive. The alternative, WiFi, has limited coverage and people have to move from one hot spot to another to use the service. But the new technology, WiMAX solves all these problems. It is wireless, which makes it cheap and easy to implement in suburban and rural areas and also it reaches the high speeds that broadband wired technologies are capable of. On top of that, WiMAX gives a broader coverage, similar to that of cell phone networks. With all these advantages, WiMAX might easily replace some of the wireless and wired technologies in use today. The aim of thesis is to get an understanding of WiMAX technology theoretically as well as practically. The WiMAX physical layer is based on orthogonal frequency division multiplexing. OFDM is the transmission scheme of choice to enable high-speed data, video, and multimedia communications and is used by a variety of commercial broadband systems, including DSL, Wi-Fi, Digital Video Broadcast-Handheld (DVB-H), and Media FLO, besides WiMAX. OFDM is an elegant and efficient scheme for high data rate transmission in a non-line-of-sight or multipath radio environment. The primary function of Physical is the actually physical transport of data itself. A variety of technologies like OFDM, TDD, FDD, QAM and Adaptive Antenna Systems (AAS) are utilized to achieve maximum performance from the Physical layer. One of the essential components of WiMAX is OFDM. Mathematical Process known as Fast Fourier Transform (FFT) is used in OFDM which enables 52 channels to overlap without losing their individual characteristics. This allows the channels to be processed at the receiver end more effectively. OFDM breaks the wireless carrier into 256 sub-carriers .OFDM is known for its resistance to forms of interference and degradation and is widely used in Wireless applications. Orthogonal frequency division multiplexing (OFDM) technology provides operators with an efficient means to overcome the challenges of NLOS propagation. The WiMAX OFDM waveform offers the advantage of being able to operate with the larger delay spread of the NLOS environment. By virtue of the OFDM symbol time and use of a cyclic prefix, the OFDM waveform eliminates the inter-symbol interference (ISI) problems and the complexities of adaptive equalization. Because the OFDM waveform is composed of multiple narrowband orthogonal carriers, selective fading is localized to a subset of carriers that are relatively easy to equalise. An example is shown below as a comparison between an OFDM signal and a single carrier signal, with the information being sent in parallel for OFDM and in series for single carrier. The ability to overcome delay spread, multi-path, and ISI in an efficient manner allows for higher data rate throughput. As an example it is easier to equalize the individual OFDM carriers than it is to equalize the broader single carrier signal. Sub Channelization in the uplink is an option within WiMAX. Without sub channelization, regulatory restrictions and the need for cost effective CPEs, typically cause the link budget to be asymmetrical, this causes the system range to be up link limited. Sub channeling enables the link budget to be balanced such that the system gains are similar for both the up and down links. Sub channeling concentrates the transmit power into fewer OFDM carriers; this is what increases the system gain that can either be used to extend the reach of the system, overcome the building penetration losses, and or reduce the power consumption of the CPE. The use of sub channeling is further expanded in orthogonal frequency division multiple access (OFDMA) to enable a more flexible use of resources that can support nomadic or mobile operation. In order to have an efficient mode of operation, scheduling has been introduced in the standard. Two different types exist, Frequency Division Duplexing (FDD) and Time Division Duplexing (TDD). 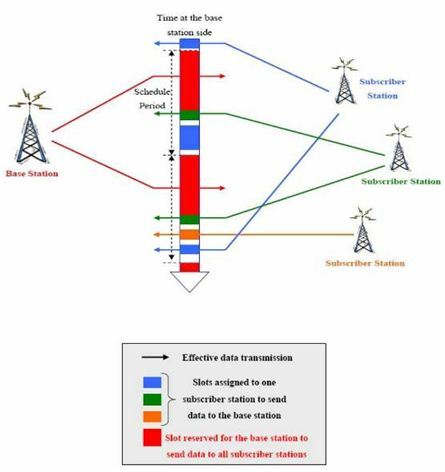 In the FDD mode of operation, data from the base station to the subscriber stations are transmitted at one frequency, and data from the subscriber stations to the base stations are transmitted at another frequency (see Figure 1). In the TDD mode of operation, only one frequency is used for data transmission in both directions (see Figure 2). AAS describes beam –forming technique and is used in WiMAX in this case an array of antenna is used at the BS for the increase in gain to the intended SS and at same time removing interference to and from other SSs. AAS technique is used to Spatial Division Multiple Access (SDMA) so multiple SSs are enabled and can receive and transmit on the same subchannel at the same time having separated by space.BS is able to direct the desired signal to different SSs by using beam forming and can judge difference between signal of different SSs even if they are operating on the same sub channels. Adaptive Antenna Systems (AAS) use beam-forming technologies to focus the wireless beam between the base station and the subscriber. This reduces the possibility of interference from other broadcasters as the beam runs straight between the two points. Diversity schemes are used to take advantage of multi-path and reflections signals that occur in NLOS conditions. Diversity is an optional feature in WiMAX. The diversity algorithms offered by WiMAX in both the transmitter and receiver increase the system availability. The WiMAX transmit diversity option uses space time coding to provide transmit source independence; this reduces the fade margin requirement and combats interference. For receive diversity, various combining techniques exist to improve the availability of the system. For instance, maximum ratio combining (MRC) takes advantage of two separate receive chains to help overcome fading and reduce path loss. Diversity has proven to be an effective tool for coping with the challenges of NLOS propagation. Adaptive Modulation and Coding (AMC) provides the flexibility to match the modulation-coding scheme to the average channel conditions for each user. With AMC, the power of the transmitted signal is held constant over a frame interval and the modulation and coding format is changed to match the current received signal quality or channel conditions. WiMAX system adjusts the signal modulation and coding scheme on the basis of Signal to Noise Ratio (SNR) condition of the radio link. When the radio link quality is high the highest modulation scheme and light coding is used giving the system more capacity (e.g. 64 QAM). During a signal fade or long signal path the WiMAX system can shift to a lower order modulation scheme with heavier coding to maintain the connection quality and link stability.WiMAX supports a variety of modulation and coding schemes and allows for the scheme to change on a burst-by-burst basis per link, depending on channel conditions. Using the channel- quality feedback indicator, the mobile can provide the base station with feedback on the downlink channel quality. For the uplink, the base station can estimate the channel quality, based on the received signal quality. The base station scheduler can take into account the channel quality of each user’s uplink and downlink and assign a modulation and coding scheme that maximizes the throughput for the available signal-to-noise ratio. Adaptive modulation and coding significantly increases the overall system capacity, as it allows real-time trade-off between throughput and robustness on each link. In the downlink, QPSK, 16 QAM, and 64 QAM are mandatory for both fixed and mobile WiMAX 64 QAM is optional in the uplink. FEC coding using convolutional codes is mandatory. Convolutional codes are combined with an outer Reed-Solomon code in the downlink for OFDM-PHY. The standard optionally supports turbo codes and low-density parity check (LDPC) codes at a variety of code rates as well. Error correction techniques have been incorporated into WiMAX to reduce the system signal to noise ratio requirements. Strong Reed Solomon FEC, convolution encoding, and interleaving algorithms are used to detect and correct errors to improve throughput. These robust error correction techniques help to recover error frames that may have been lost due to frequency selective fading or burst errors. Automatic repeat request (ARQ) is used to correct errors that cannot be corrected by the FEC, by having the error information resent. This significantly improves the bit error rate (BER) performance for a similar threshold level. 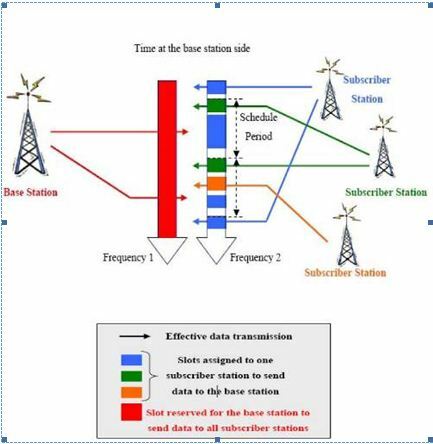 Power control algorithms are used to improve the overall performance of the system, it is implemented by the base station sending power control information to each of the CPEs to regulate the transmit power level so that the level received at the base station is at a pre­determined level. In a dynamical changing fading environment this pre-determined performance level means that the CPE only transmits enough power to meet this requirement. The converse would be that the CPE transmit level is based on worst-case conditions. The power control reduces the overall power consumption of the CPE and the potential interference with other co-located base stations. For LOS the transmit power of the CPE is approximately proportional to it’s distance from the base station, for NLOS it is also heavily dependant on the clearance and obstructions. There are five variants in Fixed WiMAX which are specified by their Physical layer. MAC protocol is used for point-to-multipoint wireless applications and it provides improved bit rates for both UL and DL. With the help of WiMAX and having bandwidth allocation algorithms it provides an effective way for multiple users to share the same channel. Each user require different services according to there needs and requirements. In such case WiMAX MAC provides support for both continuous and burst traffics which helps in the improvements of QoS. WiMAX MAC provides two main features. WiMAX supports ATM and Packet-base protocols. The task of the Convergence sub layer is to map the traffic at transport layer to MAC which helps MAC to carry different traffic types. Convergence Sub layer and traffic type work together by using payload header suppression, packing and fragmentation so that traffic can be managed and carried out more effectively. The function is based on point-to-multipoint for a WiMAX DL from the base station to the user itself. Figure below illustrates such behavior. The Link of a WiMAX usually works having a BS as the central point with an antenna which helps in the handling of multiple independent sectors in a parallel format. Having a frequency channel and antenna sector all the active channels receive similar transmission. Since the BS is transmitting information in this particular direction that is why it doesn’t require any coordination with other stations in the end DL is generally broadcast. If DL-MAP is unable to indicate a portion of DL sub frame is not a SS in that case all active SSs will listen to that particular portion of the DL Sub frame. MAC is connection oriented itself. A 16-bit connection identifiers also known as CIDS require continuous or on demand bandwidth. CIDS are used to identify difference between multiple UL’s and DL channels. The SSs check out these particular CIDs which are received in the PDUs and PDUs which are addressed to the CIDS will be returned. The MAC PDU is known as a data unit which is exchanged between the MAC layers of the BS and its SSs. By using the previous lower layer data unit generated on the downward direction. A 48-bit MAC address is included in each SS, the task if this is to identify different equipments because of using a primary address during CIDs operations. Three management connections in every direction are assigned by the SS on entering the network. These connections depict the requirement for QoS used by these particular management levels and they are given below. Basic Connection Transfer short, time critical MAC and radio link control (RLC) messages. Primary management connection Primary management connection transfers longer and delay tolerant messages used for authentication and connection setup accordingly. There exists a secondary management connection transfer standard which is based management messages known as Dynamic Host Configuration Protocol (DHCP), Trivial File Transfer Protocol (TFTP) and Simple Network Management Protocol (SNMP) and at the same time SSs are allocated transport connections for the contracted services. Transport Connections In case of transport connections a unidirectional to have a facility for different UL and DL QoS and traffic parameters they are assigned to services in pairs. Users can control the transmission protocol which can control the contention between different users in each sector and can enable the service to adjust according to the delay and bandwidth depending on the user application requirements. There are four different types of UL scheduling mechanisms which are usually utilized in order to achieve tasks. Four different types of UL scheduling mechanisms are utilized in order to accomplish such task. These mechanisms are basically used using bandwidth grants, polling and also on contention procedures. WiMAX provides different types of QoS depending on the type of application to be processed at hand. Unsolicited Grant Services (UGS): UGS is designed to support constant bit rate also known as CBR, a service such as T1/E1 emulation and VoIP without silence suppression. Real-Time Polling Service (rtPS): Designed to support real-time services that generate variable size data packets such as MPEG video or VoIP with silence suppression on a periodic basis. Non Real Time Polling Services (nrtPS): Designed to support non-real time services that require variable size data grant burst types on a regular basis. Best Effort Services (BE): For web surfing these services are provided by the Internet. There are two standards defined by the WiMAX for the sole purpose to map services to and from WiMAX MAC connections accordingly. The ATM convergence sub layer is for ATM services. The primary task of the sub-layer is to classify service data units also known as SDUs to a MAC connection to have a better QoS and efficient bandwidth allocation. In two adjacent protocol layers SDUs exchange themselves accordingly. They data units are received on the previous higher Sub layer. The mapping depends on the type of service being utilized. The other function the convergence Sub layer performs is payload header, suppression and reconstruction to have more efficient air link. There are additional connections for different purposes present in the MAC. There are connections which are based on contention and other are based on broadcast transmitting in DL and also for signaling broadcast based on contention polling to satisfy the needs for SS accordingly. There are other connections which are reserved for multi cast in such cases the SS joins the multicast polling group which are linked with the multicast connections. The TC layer is present between the PHY and MAC layer. The basic task of this layer is to transform MAC PDUs into fixed length blocks. It all begins with a pointer which points the next header of the MAC PDU which is present in the FEC block itself. In case of damaged blocks TC will follow resynchronization for next MAC PDU. In case of service flow the controlling is done by RLC itself. With the factor of WiMAX involved the process consists of transaction between the SS and BS accordingly. The configurations of FDD and TDD system depend upon a complicated process based on the service flow. The major task of FEC defines burst profiles, bandwidth and encryption. After the configuration and successful running of SS the next phase is that of acquiring channel accordingly. The newly developed protocols in the MAC allow automatic configuration for the user, the buyer or the user only needs to unpack the SS and power it up, the SS will start feeling the environment on its own. After successful running of the SS it automatically begins to feel the frequencies gathered around its range. Most probably the SS will be tuned during the manufacturing phase, in case of a dense environment where there can be existence of multiple frequencies the SS is registered with a BS to avoid collision and confusion. Synchronization takes places ones the required frequency has been selected by the SS which kinks with the BS. Once the PHY layer is synchronized with the SS it will start searching for DCD and UCD messages which allow the SS to identify the modulation and FEC schemes which will be used on the BS carrier accordingly. The SS will start searching for all valid UL-MAP messages which are present in the frames in order to identify the information for ranging, having said that the establishment of initial ranging transmission is already a success. A RNG-REQ message also known as ranging request message is required to be identified by the SS for this case a complex algorithm is used. The procedure starts with low power which after some progression will result in gain in power after some time until it receives some response regarding ranging. Parameters like time for arrival of the RNG­RNQ and the amount of power used for the establishment of transmission BS will retunes and resynchronizes with the SS with a new ranging response which is known as RNG-RSP. After the successful configuration of the timing between the SS and the BS the next phase is to refine the transmission power in order to have accurate range between them. Robust profiles are utilized for successful transmission of WiMAX accordingly. The SS will contact the PHY layer whose task is the modulation and coding for the sole purpose to avoid unnecessary usage of bandwidth. It supports both half-duplex and full duplex modulations. The final decisions are made by the BS. An authentic SS will contain a valid X.509 digital certificate which is installed during its manufacturing period. When SS asks for authorization requests these certificates are evaluated for the authenticity of the SS itself. This is done by a 48-bit MAC address within the SS including the RSA key help with the BS accordingly. By monitoring the certificates installed in the SS the network can make sure that it is the right SS for this particular network and is authorized accordingly. Based on the validation and verification of the SS it will allow entering the network if allowed. Identification will be made by the network for the SS if the authorization is valid it will allow the SS to join the network which will be done by an authorization key also known as AK which is used for privacy and security issues. Once the authenticity is made valid the SS will be registered to the network immediately. After this a secondary connection management is established for further progression within the system. An IP address is assigned to the SS by the network once the connection is made by the help of DHCP. The basic task of the dynamic host configuration protocol is to provide a TFTP address to the SS itself for the sole purpose to acquire a configuration file necessary to have for further progression. The basic task of RLC is to make sure that a stable link and make sure that the channel acquisition and service flow are running concurrently. RLC allows the WiMAX to have transaction from one burst profile to another burst profile. The functions of RLC include control of power and ranging. Periodic broadcasts of burst profiles are introduced by the RLC which works in UL and the DL accordingly. Based different factors like rain and defined equipments the burst profiles are chosen accordingly. A downlink Interval Usage Code also known as DIUC is used with the DL for every burst profile and similarly for UL a UIUC is used accordingly. The first task of SS is to check the power level and the ranging; it uses RNG-REQ messages when it first starts transmission. New forms of messages are resend back known as RNG-RSP which derives the requirement for SS with respect to power and timing. The SS during the ranging phase is allowed to be used in the Download Link; by using help of a particular burst profile transmission of DIDUC to the BS is possible. Based on the quality of DL the SS makes choices accordingly. The RNG-RSP is completely dependent on the SS, another task BS has to analyze the quality of the UL. When the initialization between the Uplink and downlink are made between the base station and the SS the job of the Radio Link Control is to analyze the burst profiles accordingly. Harsher conditions may vary the burst profile for SS. SS’s profile regarding uplink and downlink are utilized by the RLC constantly. The goal is to have an efficient and reliable system in order to have better output. The task of the BS is to look for the quality regarding uplink signal and so on there is no complexity in the change of burst profile for the UL. Whenever there is a requirement for bandwidth by SS the BS then specifically use the profile UIUC accordingly hence there is no need for any acknowledgement as the SS will automatically be receiving UIUC and burst profile hence this result in cancellation of dissimilarity between the SS and the BS burst profile. In order to change the profile the SS analyze the signal it receives from the download link. The change depends on the BS. To change a DL there exists two modes they are given as follows. This method is only applicable to GPC SS, the function is that SS is allowed to have a station which maintains which is done by BS.RNG-REQ messages are used to change the DL profile and an alternate method is that BS will reply to DBPC-REQ messages to for confirmation or denial of any change. Cost Efficiency – The very fact that WiMAX is a wireless technology means that the expensive procedure of laying cables can be avoided. This removes the cost of labour, materials, land, etc and can be replaced with the cost of only installing a WiMAX tower. This could help, bring internet connectivity to rural areas, without the cost of wires WiMAX could easily be deployed in less densely populated areas. Mobility of Data – WiMAX could bring data on the move to many users, anywhere a WiMAX connection is available and a user has appropriate WiMAX ready devices, internet connectivity will be available. Not only does this have to potential of real time media streaming, there is also the potential for VoIP on the move. Services such as Skype could be used in conjunction with a WiMAX enable mobile phone, bringing cheaper phone calls to many people. Mobility of Equipment – Not only is data mobile with WiMAX but the equipment is portable also. WiMAX towers can be quickly and easily redeployed and reused in a completely different location, enabling WiMAX networks to be setup in many different locations after it is no longer required in a previous location. Wider Coverage – WiMAX offers a much wider coverage than any current WiFi hotspot. One WiMAX tower could cover an entire city instead of many WiFi hotspots covering only a small area. Lower Data Rates at Greater Distances – As a user gets further away from a WiMAX tower their data rate will drop. Data rates at theoretical maximums are approximately 75Mbps (WiMAX.com, 2007). In reality data rates are 1-5Mbps (WiMAXforum.org, 2007), which will only get lower as a user gets further away from the source. WiMAX is Power Intensive – Advances in battery technology are limited compared to advances in processor technology. As WiMAX is a power intensive technology, it will require strong electrical support. The WiMAX signal being divided up between many different users means that the bandwidth will also be divided up, at peak times data rates could become very low. Wi-Fi has changed the way people navigate the Internet, and in record time. The technology, which is used to create wireless networks in small areas such as homes, offices, and parks, allows millions to move about freely while they surf the Web with laptops and PDAs. Demand is soaring, thanks to faster, cheaper, and more reliable technology, and to open standards that let tech giants like Intel (INTC ) bundle Wi-Fi radios into mass-market computers. Encouraged by Wi-Fi’s success, tech companies are poised to launch a new wireless technology called WiMAX, which will allow even faster Internet access across larger areas. WiMAX creates “hotspots” that stretch dozens of miles and allow users to surf the Web wirelessly at speeds that are much faster than connections via a digital subscriber line (DSL) or cable modem. A single WiMAX radio is 20 or 30 times faster than a household broadband connection. “A WiMAX platform’s ability to deliver lots of capacity at lower prices could be very disruptive to existing broadband business models. When you put voice over WiMAX, it could also disrupt the wire-line and wireless voice businesses,” says Andrew Decker, chairman of the global telecom group at Bear Stearns Investment Banking. WCDMA used DSSS to spread the signal over a 5 MHZ spectrum. It is based on 3GPP Release on 99 and provides data rate of 384Kbps for wide area coverage and up to 2mbps. For hotspot areas. The improvements in WCDMA for data capabilities came in the form of HSPA technologies which improve the data rate to 14.4 Mbps for downlink and 5.76 Mbps for uplink . The existing 3G cellular networks are developed for both voice and data communications. This situation was demanding some revolutionary standard which must ensure not only the expansion of wireless networks capacity but also the fulfillment of requirements for the future high data rate applications. The 3GPP group introduced LTE and3GPP2 group introduced UMB solution for this reason. The LTE initiative targets mobile broadband peak data rates exceeding 100 Mbps. High Data rates of up to 100 Mbps for Downlinks and 50 Mbps for uplinks. Data centric networks instead of voice centric networks. Capacity: Mobile WiMAX Capacity is better than HSPA but less than LTE. LTE aims at gaining advantage over HSPA and Mobile WiMAX in all areas – capacity, coverage and complexity. 5GHz Band: In many European and Asian countries the 3.5GHz band is licensed spectrum that is available for Broadband Wireless Access, but not use in the United States. It is the most heavily allocated band representing the largest global Broadband Wireless Access market. It Covers 300MHz of bandwidth which is range from 3.3GHz to 3.6GHz. For large pipeline backhauling in Wide Area Network services this band is very useful and it provides a great flexibility. In this licensed spectrum, major carrier’s and companies will be able to offer competitive internet subscriber fees in market of Wireless technology through the economy and lower equipment costs that WiMAX broadband wireless access brings. WCS: The two Wireless Communication Service band are identical 15MHz slots range from 2305 to 2320MHz and 2345 to 2360MHz respectively. The 25MHz gap between these bands is assigned to the Digital Audio Radio Service. For the successful deployment of these bands we need exceptional spectral efficiency such as offered by very famous modulation technique Orthogonal Frequency Division Multiplexing and RF modulation technique which commonly used by Wi-Fi and WiMAX. 4GHz ISM: The frequency in the range of 2.4GHz used by Industrial, Scientific and Medical which is unlicensed and offers roughly 70MHz of bandwidth for broad band wireless access deployment. In future WiMAX technology contains more advanced features which specify interoperable base band processor requirements will bring the two services together for complementary operation which will deliver wide area mobility to the internet user. MMDS: The Multi channel Multipoint Distribution Service spectrum includes 30 channels of 6MHz spacing in the range from 2500 to 2690MHz frequency and it includes the Instructional Television Fixed Service. Frequency planning is required to determine a proper frequency-reuse factor and a geographic-reuse pattern. The frequency-reuse factor f is defined as f≤1 Where f=1 means that all cells reuse all the frequencies. Accordingly, f=1/3 implies that a given frequency band is used by only one of every three cells. The reuse of the same frequency channels should be intelligently planned in order to maximize the geographic distance between the co channel base stations. Figure 4.17 shows a hexagonal cellular system model with frequency-reuse factor f=1/7, where cells labeled with the same letter use the same frequency channels. In this model, a cluster is outlined in boldface and consists of seven cells with different frequency channels. A popular technique is to sectorize the cells, which is effective if frequencies are reused in each cell. Using directional antennas instead of an Omni directional antenna at the base station can significantly reduced the co channel interference. Although the absolute amount of bandwidth used is three times before (assuming three sector cells), the capacity increase is in fact more than three times. No capacity is lost from sectoring, because each sector can reuse time and code slots, so each sector has the same nominal capacity as an entire cell. Furthermore, the capacity in each sector is higher than that in a no sectored cellular system, because the interference is reduced by sectoring, since users experience only interference from the sectors at their frequency. Ability to install one or more antennas—is the roof adequate to support the antenna(s) or will it require structural reinforcement? Will a tower have to be constructed? Are permits required? Possibility of future obstructions—will trees grow high enough to interfere with the signal? Are there plans to erect buildings between the sites that may obstruct the path? Availability of grounding—Good grounding is important in all areas of the world, but in areas prone to lightning, it is especially critical. Availability of power—Are redundant power systems available if the area is prone to outages. Weather-It is important to research any unusual weather conditions that are common to the site location. To get the most value from a wireless system, path planning is essential. In addition to the fact that radio signals dissipate as they travel, many other factors operate on a microwave signal as it moves through space. All of these must be taken into account, because any obstructions in the path will attenuate the signal. From the GPS machine we can find out the client location. We get the longitude and latitude value form the GPS machine .Then putting in to the Google earth software. Finally Google earth software shows us the respective location. We also collect the air distance between our base and Client location. The Way point shows us where our base station is located. When we identified our base station then we observe the sight to clarify the Line of Sight. Fixed WiMAX is the initial step of WiMAX but it has a long way to go. The world is looking for the WiMAX Mobility. As it has been in development for almost 1 to 2 years this concern is growing. Although an equally growing list of deployed networks, it is yet to be seen whether or not WiMAX will make it worldwide. Based on this report it is clear that WiMAX is a real contender for wireless internet connectivity, not only as a last mile solution but also as a strong backhaul solution. With strengths such as cost effectiveness out weighing few weaknesses, it is hard to see why WiMAX would not be used. What does the future hold for WiMAX? With the 802.16m amendment in progress, mobile data rates of up to 100 Mbit/s and fixed data rates of up to 1 Gbit/s are looking likely. WiMAX has the potential of the way we all connect. A successful WiMAX delivery is about a lot more than “just connecting” boxes with this exceptional technology – it must also include exceptional service and support. Those considering deploying WiMAX will be making an enormous investment in their network and in their future. They should seek a vendor with a robust combination of advanced network design, proven deployment and systems integration, security and operational and management experience. These competencies can help to ensure a highly efficient and quality performing network that can quickly generate new revenue streams. In addition, vendors with these capabilities can ensure that end-users receive a high degree of satisfaction the first time, and on a continued basis, as the network and business expands over time. Client Server Setup and Configuration Using Linux.